I recently bought a princess-cut citrine stone ring with a triangular diamond on each side. With summer coming to a close, I knew I wanted some outfits to pair it with so that I wouldn’t have to wait until sunny summer next year to wear it again. Fall is known for its jewel-toned color fashion: rich ruby, bold emerald, deep sapphire, etc. These vivid hues bring a richness to the cool weather, leaving those springtime pastels and summer brights in the dust. One color that’s making the scene this year is mustard. Its golden overtones bring a metaphorical warmth to battle the rigid white and fierce black of winter fashion. I think you’ll find that people of any coloring can pull this shade off. Here are five easy ways to do it! 1. Try An Oversized Sweater. Big, comfy sweaters are great for those blustery fall months because of the obvious warmth they bring. Since you’ll be wearing a sweater anyway, why not try it in this warm, bold shade of gold? We love Zeagoo Women’s V-neck Oversized Batwing Knitted Pullover Sweater ! 2. It Pairs Perfectly with Black, Navy, and Gray. 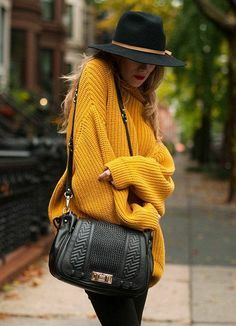 Mustard is the perfect color to balance out those dark neutrals. It contrasts so well because of its lightness in color. A black leather jacket or dark gray skinny jeans paired with a mustard top (or vice versa) can bright the look up a notch, leaving you calm, collected, and totally put together. Try these skinny jeans: Sodamix Denim Skinny Jeans Torusers Mustard Daily Party Trendy Brand New-10 . 3. A Mustard Cardi Can Lighten Your Day and Outfit. That cold air will find a way to sneak into the office, so while you’re hard at work at your desk, invest in a cute cardigan to wear over your button-up and pencil skirt. Keep the colors fairly neutral so that they aren’t overwhelmed by the brightness of the yellow cardi. A great example is the LE3NO Women’s Lightweight Round Neck Fine Knit Cardigan Sweater with Stretch . Whether it’s a scarf or necklace, mustard lets you shine like the sun. The gold tones in your jewelry will work especially well to reflect the dim light during fall months. While you won’t be wearing a headpiece like the one below (how awesome is that, by the way? ), a casual gold scarf like this one will look wonderful: Hugssy 2013 Silky Scrunch Wrinkled Infinity Scarf Circle Scarf (Mustard) . 5. Accessorize with Golden Eyes. This is really the icing on the cake. A warm golden shadow, framed by black lashes and lined lids will look alluring and innocent simultaneously. A great look for the daytime or evening, this color can bring a sizzle to your pretty features. 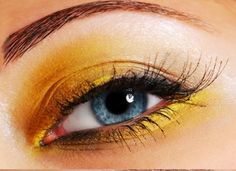 For a warm, golden look try this gold eyeshadow from L’Oreal. Like I said before, this color isn’t the easiest to wear; sometimes you might feel like a sunbeam in the face of an overwhelmed passerby. But give it a try and you’ll see how you can brighten your day and that of the people around you. Have you tried this color before? Did it work for you? Let us know!